Goodreads Summary: Alex has run away and is hiking through the wilderness with her dead parents' ashes, about to say goodbye to the life she no longer wants to live. But then the world suddenly changes. An electromagnetic pulse sweeps through the sky zapping every electronic device and killing the vast majority of adults. For those spared, it's a question of who can be trusted and who has changed... Everyone still alive has turned - some for the better (those who acquired a superhuman sense) while others for the worse (those who acquired a taste for human flesh). Desperate to find out what happened and to avoid the zombies that are on the hunt, Alex meets up with Tom - an Army veteran who escaped one war only to find something worse at home - and Ellie, a young girl whose grandfather was killed by the electromagnetic pulse. This improvised family will have to use every ounce of courage they have just to find food, shelter, while fighting off the 'Changed' and those desperate to stay alive. A tense and involving adventure with shocks and sudden plot twists that will keep teen and adult readers gripped. 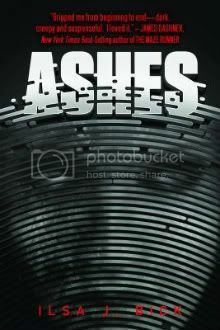 Ashes is, without a doubt, unlike anything that I've ever read. With an interesting cast of characters, imagined situations that became all too real, and constant surprises, Ashes is an edge-of-your-seat read the entire way through. Because of the nature of this book, it's hard to say much without giving something away. The suspense, the constant obstacles, and the emotional journey are what make this book riveting; the characters were just as compelling as the action. Ashes is post-apocalyptic rather than dystopian, and both Alex and Tom have some basic survival skills; this allows the story to focus on deeper issues, including learning who to trust in a world with people gone mad and what to live for when it seems there are no reasons left. Everything was so vividly described (including the behavior of the "changed" people) that I felt like I was right beside Alex and Tom, both in the woods and out of it. In Ashes, elements of science fiction, dystopian, and coming-of-age books merge into something new and exciting. I will say that this book left me with some unanswered questions. Because of all the hardships that Alex and Tom face, this book is not exactly an easy read. There were a few times that I was frustrated because I just wanted something to go right for them. But despite the sadness, and despite all of the loose threads left at the end, the intensity of this book left me wanting more. Ashes is a book that you will stay up late into the night to read - I know that I did. I am already counting down the days until the next book. I cannot wait to see what else Ilsa has in store for this trilogy! That sounds really interesting and different! Thanks for the review! I love super suspenseful stories! Great review! I so have to read this one. The cover reminds me of the move Pulse...creepy. WOW the premise of this book sounds amazing! thanks for the review, I definitely want to read this one! Sorry if my post shows up more than once. I usually get a confirmation that it went through, even if being moderated, but I’m not getting any confirmation on my desktop. Tried on my phone though and I did.